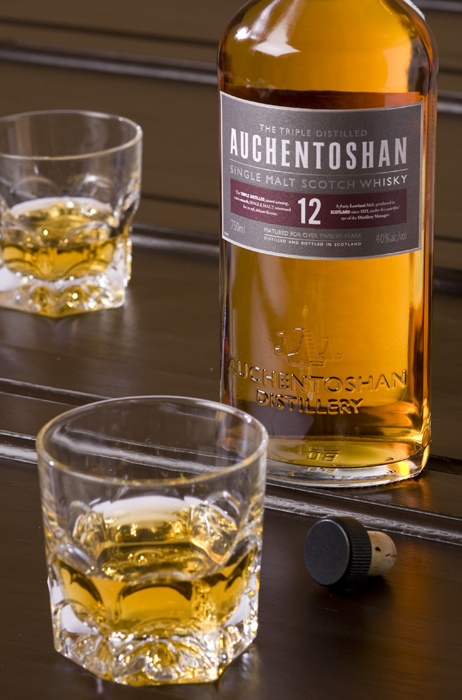 Auchentoshan 12 Triple Distilled It’s high time to up the ante on your sophistication in the arena of single malts. If you have ever seen a real distillery in the flesh, it appears at first glance to be a Rube Goldberg contraption crafted by a slightly tipsy metalworker. In fact however, the machinery is fairly simple and can yield some incredible results when manned by skilled hands. This triple distilled spirit is ‘over the moon’ smooth as a result of this multiple distilling treatment. I enjoyed its reddish hue and crisp meadow like flavor….fruit overtones and a tasty sweetness contribute to a lingering finish. It will look a bit pretentious on your shelf and appear more so if you pronounce it correctly. This singular malt will elevate your experience like few others, I rate it an 8.5 .